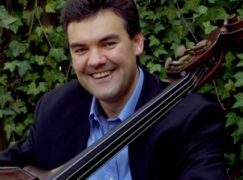 The Indiana University Jacobs School of Music has chosen Pittsburgh Symphony’s Jeffrey Turner as professor of music in double bass. Turner played principal in Pittsburgh since 1992, having joined the orchestra in 1987. Jeff is the perfect fit for this position. He will continue IU’s legacy of producing stellar bassists. A picture 30 years ago…? Now he looks very dignified. A Great addition to the IU faculty for attracting an alum of the New York String Orchestra Seminar. We are proud of ALL our alumni as we celebrate our 50th year this December at Carnegie Hall with distinguished alumni appearing on both our Christmas Eve and Dec, 28th concerts, including some of the 40 concertmasters of the world’s leading orchestras who were influenced by the Seminar as students. A fantastic appointment! Has he officially left his position as principal bass in Pittsburgh?